Quality, Service and value are at the heart of everything we do. We had the prestigious honour of supplying Turbot for the Royal visit of Her Majesty the Queen in 2011. Our commitment to standards has enabled us to receive a maximum score from the Environmental Health Department. Our shop is situated in the heart of Birkenhead’s shopping area, the famous Birkenhead Market close to many car parks and two train stations. A home delivery service is also available. 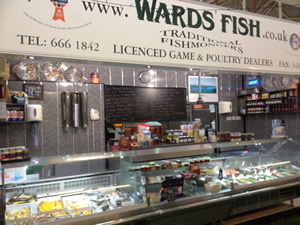 In addition to stocking a superb selection of fresh fish and shellfish from the British Isles and further afield we have a wide range of dried goods and a delicatessen . In Autumn and winter our range increases with a variety of seasonal game and meat. We are The Wirral’s official stockist of Kelly Bronze Turkeys. The KellyBronze Turkey is by far the most popular Christmas Bird that we stock. KellyBronze is recommended by top chef and food writers including Jamie Oliver, Delia Smith and The Sunday Times. The Unique texture and taste is achieved by rearing the birds slower and longer on a drug free diet, and allowing them to roam freely through pasture and natural woodland. For more information on KellyBronze turkeys please go to our Christmas section.